(Matthews, North Carolina) March 31, 2016 – CEM Corporation, a leading supplier of process control solutions, is pleased to announce that it’s new SMART 6™ Moisture/Solids Analyzer was named one of the top new products at Pittcon by Instrument Business Outlook. The SMART 6 features two major innovations compared to other moisture analyzers: the ability to accurately analyze both wet and dry samples and a significant reduction in sample drying times. These benefits are possible through the development of iPower® technology, which features a patented multi-frequency energy source for sample drying. 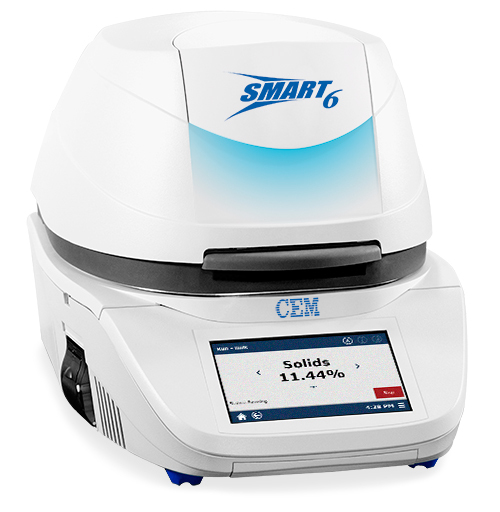 The SMART 6 also features a high resolution touchscreen with software for complete statistical analysis and a built-in library of methods. Since the introduction of the SMART 6 in December, around 200 systems have been sold. Many of these systems are being placed in companies where critical at-line changes can now be made faster than ever, saving companies time and costly reformulations. CEM estimates the moisture/solids market to be greater than $100M and are proud to bring an innovative solution to meet the needs of today’s manufacturing demands.